Silvia was born in México City in the bosom of a catholic family. She graduated with honors as bachelor in Business Administration with specialization in Finance and Marketing from Universidad Iberoamericana in México City. 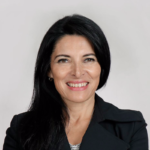 She began her professional journey back in 1985 at a large bank in México and has spent 20 years in the financial sector at different international banks such as Banamex, Citibank, and Scotiabank achieving VP positions. Among her most important achievements in the sector were leading the negotiation and restructuring of large syndicated debts of important corporations after the financial crisis in Mexico in 1995. She also managed areas as cash management, deposit product, foreign trade financing, factoring and leasing designing and releasing innovative products and solutions that are still being used today. In 2004 she left the financial industry to establish her own company focused on strategic planning consulting, organizational development and executive training. She also graduated of a master in psychology at Universidad del Valle de México. Simultaneously to her professional career she devoted to the volunteer work in favor of the most vulnerable children collaborating with different organizations like S..O.S. Children Villages, Mother Theresa orphanage and World Vision where she was appointed as Board Member for 9 years and also to the World Vision International Board. She decided to resign to those activities to accept the offering to be the National Director of World Vision Mexico since 3 years ago, she accepted because she wanted to dedicate her live to materialize her experience directly to the most vulnerable communities, focusing in children. Silvia is mother of two, Stefano, 23, and Gianluca, 21 years old.